POWDER SOUTH Heli-Ski Guides works with the best helicopter-ski pilots in the industry. 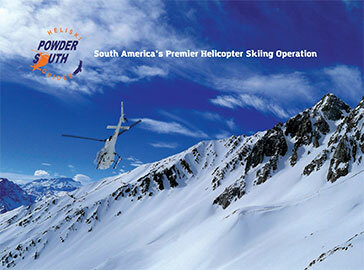 Powder South partners with the most reputable Local Helicopter Companies in Chile as well as Air Zermatt in Europe, whose reputation for high altitude flying and mountain rescue is unsurpassed. These partnerships have created the best team of pilots around. Air Zermatt pilots fly our clients to the top of remarkable ski and snowboard descents as well as train and share their flying expertise with the best local Chilean pilots in heli-ski flying tactics. The partnership between Air Zermatt, and POWDER SOUTH Heli-Ski Guides provides an unparalleled level of safety and quality heliski experience. Our team of pilots are highly trained and experienced professionals with thousands of hours of flight time in the Andes and other mountain ranges around the world, including the Himalayas, the Alps, and Turkey. They know the Andes Mountain Range exceedingly well and manage landing zones at high altitude with superior expertise. Our pilots are the finest helicopter pilots available in the Southern Hemisphere. Each helicopter is equipped with a GPS, satellite phone, VHF, first aid, oxygen, avalanche, rescue, and survival equipment. We use state-of-the-art AS 350-B3 and Bell 407 Helicopters, the highest possible standard for heli-skiing in the high Andes.